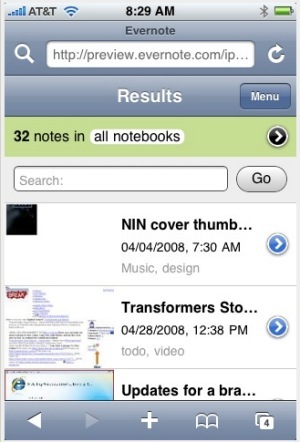 Evernote is not just a useful iPhone application. It is much more than that. Evernote is a system which you can use to remember and recall almost any piece of information. Evernote accepts may types of information including text, audio, PDF’s and photographs. It is this last type, the photograph, that I find the most useful. Using the free Evernote application, I take a photo with my phone. and it is uploaded to my account at Evernote. Great you say!! Another Flickr or photobucket website. No,. No, No it is much more than that. Once your image is uploaded to the site, it OCR’d (Optical Character Recognition) and the results are indexed for future reference. It’s just matter of search on key word, like the name of a company and up come all the notes and images with those keywords. No more remembers product codes or serial number, password or security keys. A quick snap of the camera and it’s “remembered” forever. They also have a really cool “blogcast” you can find in the iTunes store or at their site.